Born and raised in Dallas, Vaughan began playing guitar as a child, inspired by older brother Jimmie. When he was in junior high school, he began playing in a number of garage bands, which occasionally landed gigs in local nightclubs. By the time he was 17, he had dropped out of high school to concentrate on playing music. Vaughan’s first real band was the Cobras, who played clubs and bars in Austin during the mid-’70s. Following that group’s demise, he formed Triple Threat in 1975. Triple Threat also featured bassist Jackie Newhouse, drummer Chris Layton, and vocalist Lou Ann Barton. After a few years of playing Texas bars and clubs, Barton left the band in 1978. The group decided to continue performing under the name Double Trouble, which was inspired by the Otis Rush song of the same name; Vaughan became the band’s lead singer. For the next few years, Stevie Ray Vaughan and Double Trouble played the Austin area, becoming one of the most popular bands in Texas. In 1982, the band played the Montreux Festival and their performance caught the attention of David Bowie and Jackson Browne. After Double Trouble’s performance, Bowie asked Vaughan to play on his forthcoming album, while Browne offered the group free recording time at his Los Angeles studio, Downtown; both offers were accepted. Stevie Ray laid down the lead guitar tracks for what became Bowie‘s Let’s Dance album in late 1982. Shortly afterward, John Hammond, Sr. landed Vaughan and Double Trouble a record contract with Epic, and the band recorded its debut album in less than a week at Downtown. Vaughan’s debut album, Texas Flood, was released in the summer of 1983, a few months after Bowie‘s Let’s Dance appeared. 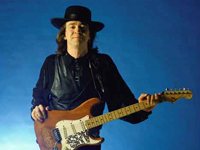 On its own, Let’s Dance earned Vaughan quite a bit of attention, but Texas Flood was a blockbuster blues success; receiving positive reviews in both blues and rock publications, reaching number 38 on the charts, and crossing over to album rock radio stations. Bowie offered Vaughan the lead guitarist role for his 1983 stadium tour, but he turned him down, preferring to play with Double Trouble. Vaughan and Double Trouble set off on a successful tour and quickly recorded their second album, Couldn’t Stand the Weather, which was released in May of 1984. The album was more successful than its predecessor, reaching number 31 on the charts; by the end of 1985, the album went gold. Double Trouble added keyboardist Reese Wynans in 1985, before they recorded their third album, Soul to Soul. The record was released in August 1985 and was also quite successful, reaching number 34 on the charts. Although his professional career was soaring, Vaughan was sinking deep into alcoholism and drug addiction. Despite his declining health, Vaughan continued to push himself, releasing the double live album Live Alive in October of 1986 and launching an extensive American tour in early 1987. Following the tour, Vaughan checked into a rehabilitation clinic. The guitarist’s time in rehab was kept fairly quiet, and for the next year Stevie Ray and Double Trouble were fairly inactive. Vaughan performed a number of concerts in 1988, including a headlining gig at the New Orleans Jazz & Heritage Festival, and wrote his fourth album. The resulting record, In Step, appeared in June of 1989 and became his most successful album, peaking at number 33 on the charts, earning a Grammy for Best Contemporary Blues Recording, and going gold just over six months after its release. 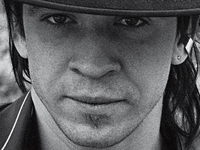 In the spring of 1990, Stevie Ray recorded an album with his brother Jimmie, which was scheduled for release in the fall of the year. In the late summer of 1990, Vaughan and Double Trouble set out on an American headlining tour. On August 26, 1990, their East Troy, WI, gig concluded with an encore jam featuring guitarists Eric Clapton, Buddy Guy, Jimmie Vaughan, and Robert Cray. After the concert, Stevie Ray boarded a helicopter bound for Chicago. Minutes after its 12:30 a.m. takeoff, the helicopter crashed, killing Vaughan and the other four passengers. He was only 35 years old.